In the final 12 home and away from 12 March onwards, Arsenal won only two, the Leicester home game and away at Sunderland on 20 April. In the final five games Arsenal scored just two goals. Arsenal thus finished 14th in the league, having gone out of the FA Cup 0-3 in the third round. Wright’s tenure had resulted in league finishes in 7th, 8th, 13th and 14th position and long before he left it was known he would not continue at the club for another year. Then came the World Cup and all the furore surrounding that, Bertie Mee, the physio, was appointed manager, and Arsenal started out again. Bertie’s opening for Arsenal was mixed. In the first seven games Arsenal won the first three, and then drew three and lost one, and the crowds moved back to the high 20,000s and low 30,000s. After those seven games Arsenal played their first ever round in the League Cup – a competition which had been running for several years, but which Arsenal had refused to enter. Arsenal were drawn at home to Third Division Gillingham – who had already battled through one round winning 2-0 against Fourth Division Southend after a replay. The game was played on 13 September in front of just 13,029, and memories of Wright’s cup disaster at Peterborough in 1965 looked large. 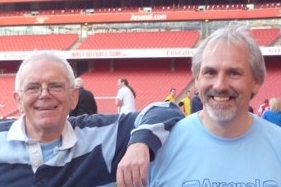 Arsenal went behind from a 25 yard speculative shot by Charlie Crickmore which took Jim Furnell by surprise. Tommy Baldwin (the subject of our last article), scored the equalizer. The replay on 22 September 1966 was a farce, being played in thick fog which had rolled in from the Medway. 20,566 turned up (compare that with the Highbury crowd) but for anyone at either end, only half the pitch was visible. That might seem preposterous now, but it happened in the 1960s, indeed I can also remember a match at Bournemouth being played in similar conditions around this time. The rule was, if the ref could see each goal from the centre spot, and the linesmen could see across the pitch, that was fine. Who cares about the paying public? On 65 minutes the noise level in the crowd increased, leaving half the stadium shouting to the players to find out what was going on. Gillingham had a penalty. Rackstraw scored, and Arsenal were 0-1 down. Arsenal left it late, but finally found their way through the fog until up popped Tommy Baldwin again, for another late goal. Extra time brought nothing more, the managers tossed the coin and Arsenal won for a second replay at Highbury. This time 18409 turned up on 28 September 1966 perhaps put off a little by the fact that after three draws in a row in the league Arsenal had just lost 3-1 away to Chelsea, making it three wins, four draws, two defeats – and two draws against third division opposition. The mutterings were loud. The Arsenal programme notes referred back to the New Brompton / Woolwich Arsenal games in 1899 in which the clubs had played five times before New Brompton (as Gillingham were then known) finally won in the preliminary competition. But this time Arsenal got their act together, and won 5-0 with another two from Baldwin, two from McLintock and one from Coakley. In the league the situation got worse, with only two wins in the next ten, leaving Arsenal 16th in the league half way through December. As for the league cup Arsenal played West Ham in the 3rd round and lost 3-1 at home on 3 October. The anniversary index appears on the home page.